Welcome to Aussie Bee Online. We hope you enjoy exploring Australia's wonderful native bees through these free articles! Article 26 -- How to Make Nest Blocks for Resin Bees. Note: Most articles are provided in both PDF and HTML formats. If you wish to use the PDF versions but can't view PDFs on your computer, click here to download your FREE copy of Adobe Acrobat Reader. Australian native Resin Bees, Leafcutters, Masked Bees and Wasp Mimic Bees can be encouraged to nest in small timber blocks with drilled holes. Follow these step by step instructions and make your own 'Bee Hotel' for these fascinating native solitary bees. HTML version not available for this article. Les first explained his vision to support native bees with drilled timber blocks over 20 years ago -- in Aussie Bee Bulletin! Download 1998 article (size: 570 K). You are welcome to print out as many copies as you wish of the Aussie Bee Online cover page and articles to share with your friends. You may also email them to friends or host them on other websites. However, the cover page and all articles must be kept in their full and unaltered version including all ANBRC contact details. Learn more. After research stretching over 35 years, we have finally sorted out the species of the Austroplebeia stingless bees! Our 2015 revision paper with Dr Claus Rasmussen identifies and describes all the Austroplebeia bees in Australia and New Guinea -- including a new species. Download this free article, to read all the key results and find out how the research was done. In 2010 Megan Halcroft and Aussie Bee asked stingless bee owners across Australia to participate in a survey -- and 637 beekeepers responded! Here are the major findings of this important survey. In this article we report for the first time the queen's egg laying behaviour in the new Australian stingless bee species, Austroplebeia cincta. After a five week safari researching their nests and behaviour, Aussie Bee is proud to present the fascinating story of the beautiful Austroplebeia cincta stingless bees. Also read our introductory story and watch videos on this beautiful new species! Workshop participants at the Blue Mountains Group of the Australian Plant Society built a unique Bee House to support their local native bees -- guided by native bee researcher Megan Halcroft. Find out how they did it! Les and Anne Dollin undertake a Native Bee Safari to The Kimberley, one of the most remote areas of Western Australia. This popular article has been reprinted from Aussie Bee Bulletin, Issue 3. Colour photos from this safari can be seen on our Facebook page. Ric Wade's hive of stingless bees was massively attacked by South African Small Hive Beetles. Ric saved his bees through dedicated hard work and by engineering a precise beetle-excluding mesh for his hive. Here, Ric kindly presents full details of his hive protection system. Les and Anne Dollin continue their Native Bee Safari on Cape York, visiting Thursday Island and Old Mapoon. This popular article has been reprinted from Aussie Bee Bulletin, Issue 2. Colour photos from this safari can be seen on our Facebook page. Les and Anne Dollin set off on a four wheel drive adventure - On Native Bee Safari on Cape York. This popular article has been reprinted from Aussie Bee Bulletin, Issue 1. Colour photos from this safari can be seen on our Facebook page. Sara Leonhardt explains the amazing uses of resins by stingless bees in Australia and Borneo, that she discovered during her PhD studies. Never before had so many questions been asked about an Australian native bee at the same time. Read all about this unprecedented event that raised awareness of our precious native bees in 24,000 school students! Thousands of bees may die in battles to the death in fighting swarms of stingless bees. What triggers this behaviour? Ros Gloag of the University of Sydney used DNA techniques to find some answers. Read our detailed report on her findings. African Small Hive Beetles are invading eastern Australia. Will they harm our Austroplebeia stingless bees? Megan Halcroft of the University of Western Sydney made some fascinating discoveries. Fifty one native bee enthusiasts and ten presenters descended on the University of Western Sydney in 2006 for Australia's biggest ever native bee workshop. They came from NSW and interstate for two days of seminars, practicals and lively discussions. Read our detailed report. Dr Katja Hogendoorn and her team at the University of Adelaide have shown that blue banded bees could be a great alternative to European bumblebees for the Australian greenhouse tomato industry. Melissa Bell's research at the University of Western Sydney - Hawkesbury has now shown that blue banded bees (Amegilla) can be efficient pollinators of greenhouse tomatoes. Australian blue banded bees (Amegilla) can be encouraged to nest in small portable clay nest blocks in your Bee Hotel. Follow these step by step instructions and make your own nest blocks for your native blue banded bees. Native Bee Hives Viewed in Spectacular 3D! Mark Greco of the University of Western Sydney - Hawkesbury has developed an amazing new way of safely looking inside the nests of native bees using 'X-ray computerised tomgraphy' or CT scans. See Mark's remarkable three dimensional images of stingless bee hives and blue banded bee nests. How many drones mate with a virgin queen stingless bee when she soars away on her mating flight? Does the queen bee lay all the eggs in the brood comb? Kellie Palmer of the University of Sydney has used innovative DNA techniques to answer these questions -- with some surprising results. The bushfires of 2001 devastated the bee gardens at Aussie Bee along with many precious bee nests. But just eight months later the gardens are back! What's more, with our new knowledge of plants loved by native bees, we have been able to create even better gardens. This 39 mm long bee with enormous pointy jaws, Megachile pluto, was found in 1859 in the jungles of Indonesia, then not seen again for over 100 years. Finally in 1981 the bee was rediscovered. Read the fascinating history of this bee and explore the amazing nests it builds inside the nests of termites. This simple, non-invasive method is gaining wide popularity. The Natural Hive Duplication technique is described in full detail for the first time. Stingless bee keepers are asked to help the ANBRC by making some observations. Note: Other names for this technique are: Eduction Method, Budding and Soft Splitting. Melissa Bell of the University of Western Sydney -Hawkesbury is conducting Australia’s first glasshouse trials with native blue banded bees. The latest results in this groundbreaking study show the potential of these bees for tomato pollination. Meet the authors and explore the variety of topics to be covered in Aussie Bee Online, this exciting FREE resource from the Australian Native Bee Research Centre. We hope you will print out copies of these Aussie Bee Online articles and keep them in a ring-backed binder. 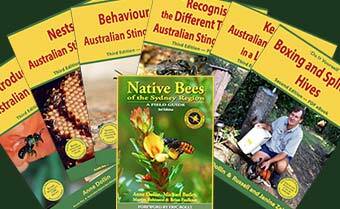 They will build up, year by year, into a substantial new addition to your native bee library. We have provided this colourful cover page (featuring some of our best loved Australian native bees) so you can decorate the front of your binder. HTML version not available for this page.